The content of this site is provided for informational purposes only and is a subject to modification without notice to you. While information posted on this site is believed to be reliable and accurate at the time of posting, Rental Bulgaria does not guarantee that the information contained on this site is accurate, complete, reliable, verified or error-free. Rental Bulgaria do not guarantee and do not have any obligations regarding the condition of this site and its usability, whether this site will operate uninterrupted or error-free, or that this site will operate in combination with any services or software used in connection therewith..You take full responsibility of any risk connected with loss of any nature whatsoever resulting from the usage of this site. Taking into consideration the above mentioned, you acknowledge and agree that Rental Bulgaria or any of its directors, officers, employees or agents shall not be liable to you for loss of data, computer time or any loss or damage of any nature whatsoever arising out of your use or inability of use of this site for any reason whatsoever. 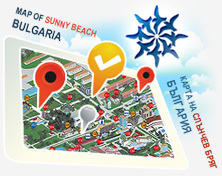 This site contains links to other sites which are not maintained or controlled in any way by Rental Bulgaria. Such links are provided for your convenience only and are not to be taken as supported by Rental Bulgaria for their products, services, advices, opinions or any other contents in them. For more information concerning the terms and conditions of use of this site or for authorization to reproduce or/and spread the contents or parts of it, please contact: reservations@rentalbulgaria.com.